This year I have a lot of "lasts" to write about. It's my last year in England, my last December here, and my last Birmingham Frankfurt Christmas Market. 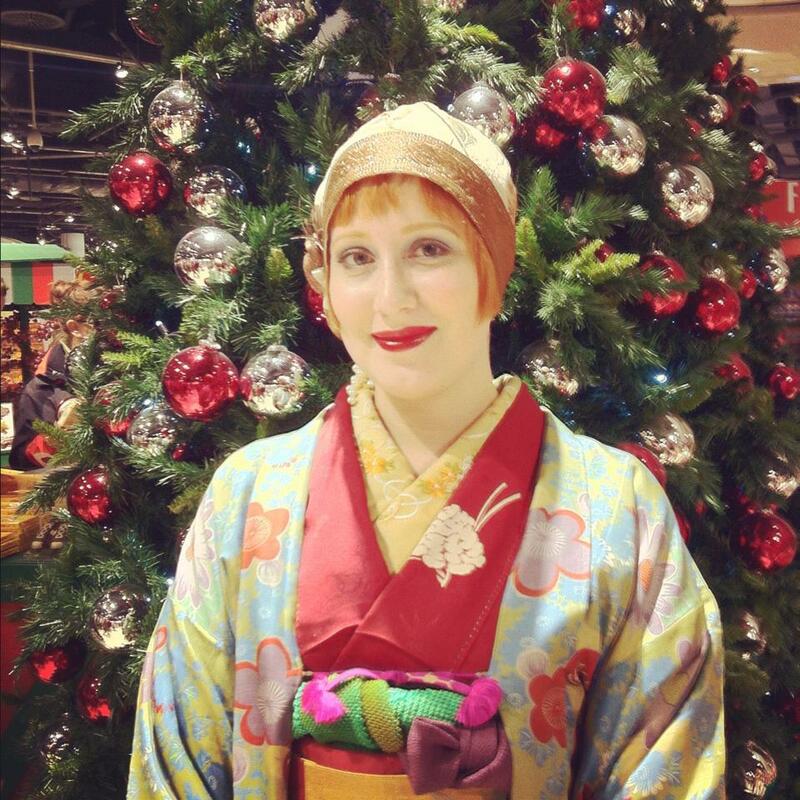 For our December Kimono de Jack we have a tradition of going to Birmingham for the Christmas Market there, and like I was saying before, this year is my last. I'm starting to get a bit sentimental about leaving England. Yes, it's not my favorite place in the world, but I still spent the 4 years of my life here, made good friends and great memories, and I will miss some things about living here. The day before leaving for Birmingham I picked up Hong from London so she could keep me company on the 2hrs drive. Several month ago we talked about wearing out twin kimono, and this trip seemed like perfect opportunity. I mean think about it! Twin kimono, in dark red, with PINE CONES being worn to a Christmas Market. Could it get any more perfect than that? In reality, the two kimono are not completely alike. Hong's looks like it's made from chirimen, while mine is from rinzu silk with various designs woven in. Also, the mons are different. It's almost seems like her kimono was trying to imitate mine but whoever commissioned it didn't have the funds to get one exactly the same. We had a blast making up stories about these two kimono during the weekend. So far we came up with a story of two sisters, living during Taisho era. One got married into impoverished samurai family (Hong), and the other into a successful merchant family. They got two kimono made that looked almost the same, except the samurai wife could only afford chirimen silk. The merchant wife was a flamboyant modern woman of her time, so she went all out on rinzu with extra SNAZZ! I wanted to be all Christmas-y and New Year-ish in my coordination, so I paired up this kimono with one of bamboo obi I had. After that, the rest of coordination sort of fell in place. To match the gold in the obi I pickd my gold striped boots and olive & gold haneri. The haneri also matched the haori I wore. The haori had dark red designs that matched the kimono and blue that matched the obijime. One of the obiage also pulled purple from haori, and the other green one was one that I just wanted to wear. I think it adds just a bit more color in otherwise very repeating (color palette wise) outfit. To top the whole thing off (pun intended), I wore my newest hat. We walked around, had some mulled wine which made everyone who had it rather happy and tipsy, and in general, enjoyed each other's company. I will definitely miss hanging out with everyone after I leave.